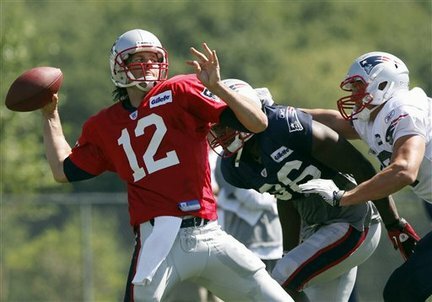 Buffalo Bills vs New England Patriots 2010 NFL Odds & NFL Picks - The poor Buffalo Bills. After getting spanked in there NFL Picks game last week by the Green Bay Packers 34-7, the Bills must travel to Foxboro and handle an angry New England Patriots team in a week three match-up featuring two AFC North division foes. This game also features the most lopsided NFL Odds match-up this weekend. The NFL Odds & Lines makers have installed New England Patriots -15 -110 Betting Odds favorites. New England (1-1) has not lost a NFL Picks game to the Bills since December 2003 and is currently riding a 13-game winning streak against Buffalo. The games have been close, including a 25-24 contest last season, but the Buffalo Bills (0-2) NFL Odds +15 underdogs are struggling. Buffalo has scored a total of 17 points this season and their offense seems like a rudderless ship. Trent Edwards has struggled in the passing game, and the running game has not done much better. Expect more ineptitude this week, although Lee Evans can go get the ball on deep passes. On defense, the Bills played well in their week one loss against Miami but were torched against a good passing offense in the Packers, and they get Tom Brady this week. As dominating as the Patriots looked against the Cincinnati Bengals in week one, the loss to the New York Jets came as a surprise to many fans in New England. The Pats are angry coming into this NFL Week 3 Picks contest and that is bad news for the Bills. Brady and Randy Moss have owned the Bills in recent years and there is no reason to think another double-digit win isn’t on the horizon. Vegas-spreads.com Week 3 NFL Predictions Patriots will cover the Vegas NFL Point Spread, and the Bills will limp home, yet again, still looking for their first NFL Picks win of the 2010 NFL season and an identity on offense and defense.